Being pregnant is an amazing time and probably the most deserving time to be pampered. There are so many changes that your body goes through, and that’s one thing that I’m learning quickly as this is my first pregnancy. It only makes sense that by nurturing your body you will help nurture the baby. Despite trying to be relaxed, pregnancy can however be a very anxious and worrying time. A massage is probably one of the most effective ways to de-stress, but it is important that you receive a massage that is tailored to being pregnant, and one that is provided by someone who is fully trained in giving a pregnancy massage. 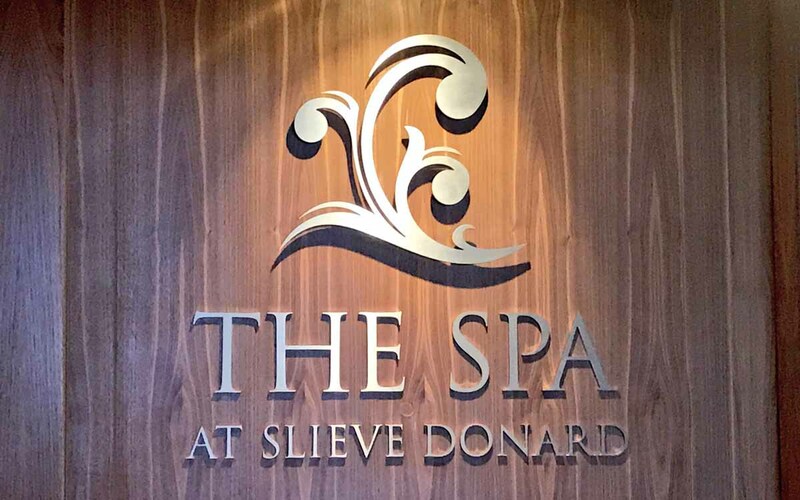 I was recently treated to an amazing prenatal massage at the Slieve Donard Hotel Spa. The entire 80 minutes were wholly blissful! I have never felt so relaxed in my life, it was perfection. There are several benefits to receiving a massage during pregnancy. Perhaps the biggest is the pain relief that a massage can help with, especially in your back. As your body changes your muscles work harder to keep you upright, and this can lead to aches and pains, especially in your back. Not only can a massage ease the stress and tension that your body is under, it can also help to balance out the additional hormones in your body during pregnancy. A study by the University of Miami School of Medicine also found that a massage can help reduce anxiety during pregnancy, and even lead to a better nights sleep, which is something I definitely experienced after my massage. You can read more about the benefits of a pregnancy massage here. A prenatal massage should be gentle, relaxing and soothing, and without a doubt this is what I experienced during my massage. 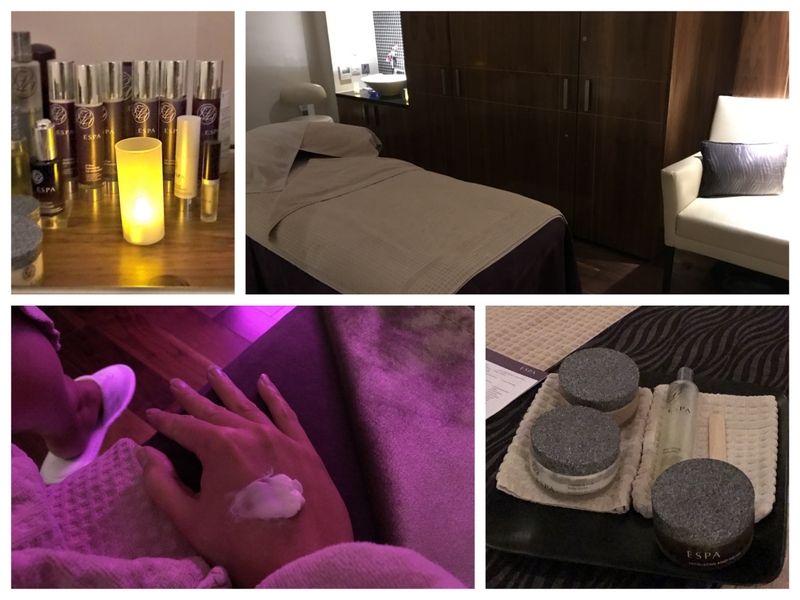 After changing into a dressing gown and slippers, I was greeted by my therapist Catherine who led me to one of the beautifully tranquil treatment rooms. I sat in the chair and my prenatal massage began with a fabulous foot treatment. Catherine was such a warm and welcoming girl and you couldn’t help but feel relaxed from the word go. The foot treatment began with a gentle exfoliation using ESPA exfoliating body polish. 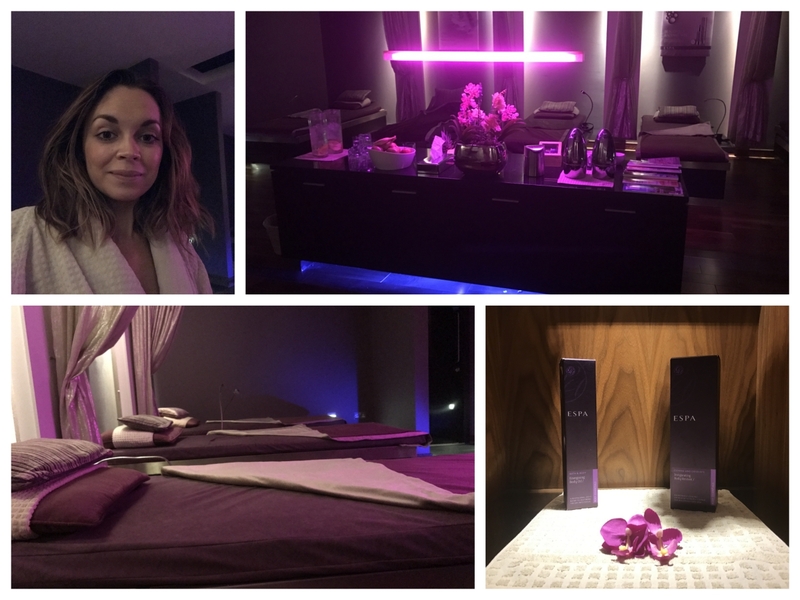 The Slieve Donard Spa uses ESPA products, which pride themselves on creating natural skincare products and supplying them to some of the world’s leading spas. This refreshing and nourishing body polish contains Aloe Vera which nourishes the skin, apricot seed kernels to gently exfoliate and spearmint to cool and refresh. Importantly, like all the products used during the pregnancy massage, it does not contain essential oils so nothing will enter the blood stream. After one foot had been exfoliated I placed it in a bowl of warm water which sat beneath me on the floor. Catherine moved on to my other foot before allowing both feet to soak in the warm water for a few minutes and then being gently dried with a warm, soft towel. Feeling already in a state of trance I moved over to the bed. I sat on the edge of the bed while Catherine gently exfoliated my back using the same ESPA body polish, before wiping it off with warm water and proceeding to dry it with a clean, warm towel. Now it was time to begin the body massage. I lay on my left hand side and Catherine ensured that a folded towel was placed between my knees to prevent strain on my back. She began to massage the right hand side of my back and then she moved down to the back of my right leg. Now, a deep massage would be unsafe during pregnancy and I had always, and wrongly, perceived that you needed this to remove knots in a tense back, but Catherine gently worked away every knot and stress from my back and shoulders without any pressure. It was so relaxing and I could feel (and hear) every knot being released. It was very soothing. Catherine used a mix of the ESPA ‘smooth & firm body butter’ and the ESPA ‘pink hair & scalp mud’ to massage the skin. The rich body butter melts into the skin and contains Larch extract to restore suppleness, and pumpkin seed extract to enhance elasticity and help eliminate stretch marks, making it perfect during pregnancy. It also contains Omega 3, 6 and 9 and antioxidant Vitamin E to rejuvenate the skin. After a lengthy massage, I rolled over onto my right side and Catherine proceeded to repeat the same soothing massage on the left hand side of my back and the back of my left leg. Now it was time to lie on my back so that Catherine could massage the front of my legs and my feet. As I lay there with my eyes closed, I felt like I was melting into the bed. I was so relaxed and I felt so light. There were several points when I had to stop myself from falling asleep! Catherine gave me a few tips along the way, including a few to share with my husband so that he could give me lovely foot massages at home (Nial I hope you’re reading this, it’s been a few days…..!!). One really important tip she shared was to not work the ankles too much as in reflexology the ankles relate to the female reproductive system so it wouldn’t be sensible to release toxins. Catherine then moved on to a gentle tummy massage to boost circulation. It was lovely, and I think the baby sensed I was enjoying it as I think I felt it’s first wee flutter at this point!! The massage ended with a hair and scalp massage using ESPA pink hair and scalp mud. This mud soothes and nourishes hair and skin. It contains Vitamin C-rich watercress and Apricot kernel oil to soothe and nourish while the red clay stimulates circulation. Catherine explained that it is so gentle and nourishing that it is also great for very dry hands and even nappy rash too. At the end of my treatment I resided to the relaxation room where I lay sipping fruit infused, iced water while listening to gentle songs. I literally felt like I was hovering above the bed, it was incredible. Catherine advised me not to use the sauna or steam room as they can cause you to overheat which is dangerous during pregnancy. And to be honest, I didn’t want to have to wash off all the lovely lotions used on my skin and hair for a while longer. I was happy to lie on the bed and and let the time slip by, I was going to enjoy every minute of feeling this way, and I did! 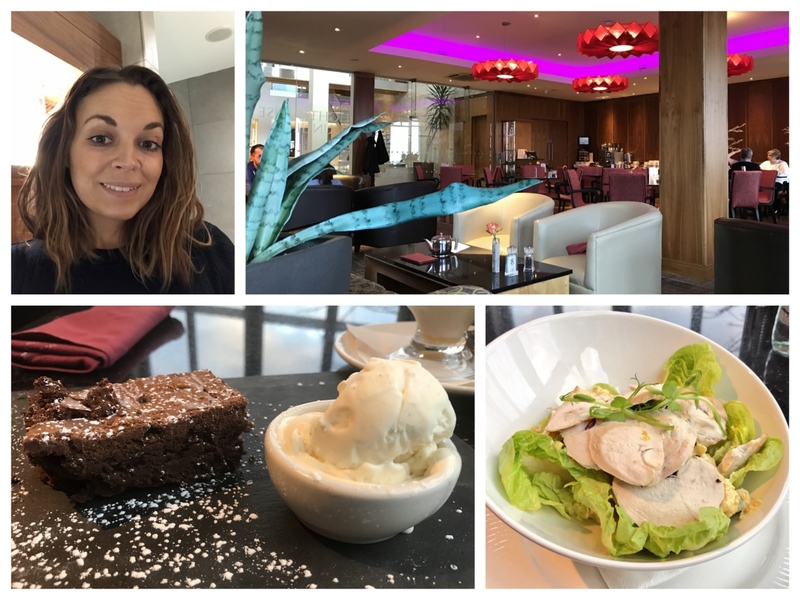 Eventually I dragged myself up and decided to get changed, but still unwilling to enter normality I decided to treat myself to a lovely light lunch in the Lighthouse Lounge, followed by a chocolate brownie as an extra treat! I would definitely recommend the prenatal treatment, and in fact if you can, it would be advisable to go a few times. 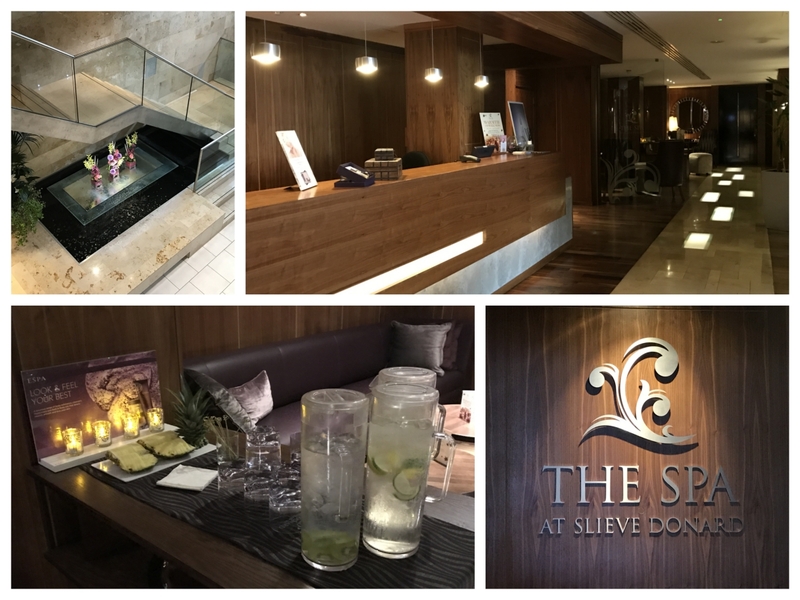 The Spa at the Slieve Donard Hotel also offer a post-natal massage and I will be sure to try this one after the baby arrives in May. All ESPA products mentioned, along with other ESPA products, are available to buy at the Slieve Donard Spa. Have you any pregnancy tips? As this is my first baby, I’m still getting used to the changes in my body and finding different ways to relax and deal with some of the aches and pains that result from the changes. I’d love to hear your tips on dealing with being pregnant, especially if it’s your first. Feel free to share your advice below or over on our Facebook or Twitter page. I’ll look to add some of these to a follow up article.